2. Sleigh Gift Bag £3.50 [x] : This gift bag is adorable and so wonderfully over the top that I think it would be perfect for a child's present. Extra points if you can get an adorable little santa or reindeer to put in it because seriously how perfect would that be? 3. Stripe Round Small Gift Box £3.75 [x] : This gift box reminds me a lot of the type of one you'd get for a Lush gift set, which obviously coming from me means it's amazing. Perfect if you want to buy someone a few little things but make it look extra special! 4. Snowman Gift Tags pack of 6 £4.20 [x] : For the special people in your life, pick up some of these beautiful snowman gift tags that will make any present look that extra bit more special. 5. Merry Christmas Sticker Box pack of 50 £2.00 [x] : If you need to make a last minute dash to pick up some labels, why not choose this adorable pack of 50 for only £2.00! It's amazing value and such a no hassle option! 6. Talking Tables Metallic Washi Tape, set of 3 £4.50 [x] : If you're looking to wrap up presents in style, pick up some of this gorgeous metallic washi tape selection! I may actually have to pick some up myself! Thanks for reading lovelies! Have an amazing next few days, and thank god it's nearly Christmas! the gift tags are so sweet, they'd look so lovely on my pressies - think I'm going to have to go on a last minute hunt for these! What I love about this weeks theme (other than the fact that it still relates to Christmas) is how all the items are affordable. 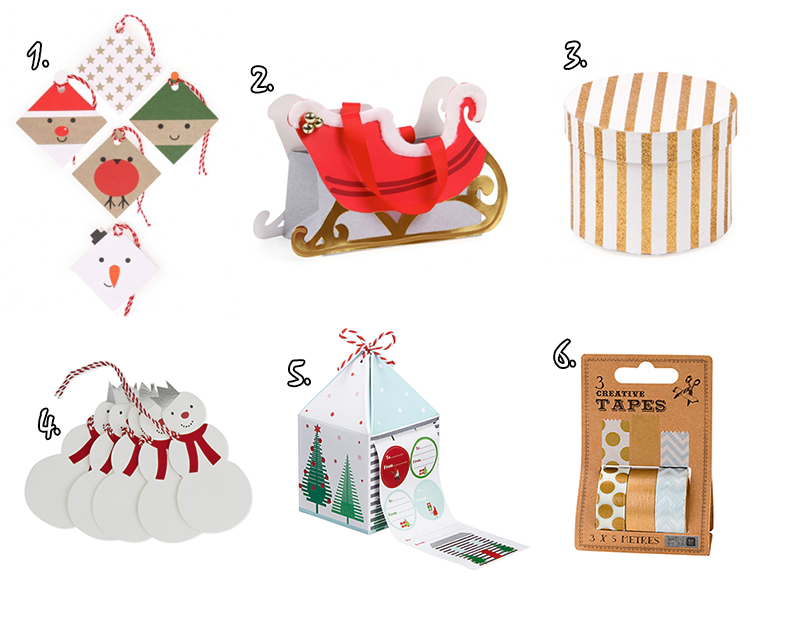 I love the whole idea of the sleigh gift bag and the pretty gold tape. I have always been about traditional Christmas and like to keep it classy with golds, reds, whites and silvers.